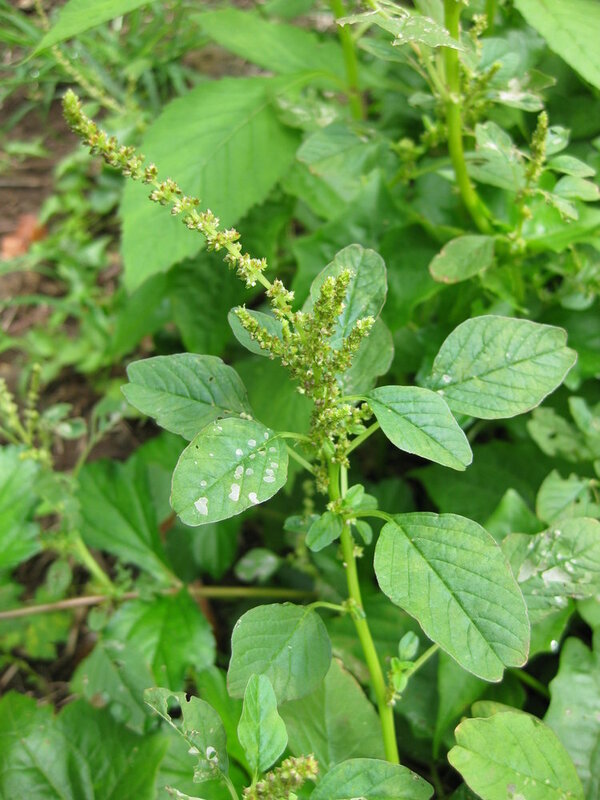 Amaranthus blitum is an annual C4 herb (Costea and Tardif 2003), coarse, stems prostrate to erect, 6-60 cm, pale green to reddish, rather fleshy. Possibly colonized by some mycorrhizal fungi (Costea and Tardif 2003). Leaves alternate, stalk 1-3 cm long, blade 1-3 cm long, rhombic to egg-shaped, tip broadly notched, base wedge-shaped, dull dark green. Flowers greenish, sexes separate, sepals of female flowers 2, to 0.2 cm; mostly self pollinated (Costea and Tardif 2003); inflorescence of dense, mealy, axillary clusters or short spikes 2-8 cm long. Fruit dry, 1-seeded, 0.2 cm. Seeds dispersed by birds and by water (Costea and Tardif 2003). Habitat: Open, dry, disturbed soil, especially near shore. Also along street curbs, waste areas. Notes: Apparently edible but concentrates nitrates in chemically fertilized soils (Fern 2004). Has also been used for medicinal purposes. Red pigments are betacyanins. Plants eaten by rabbits and other mammals, seeds eaten by many birds (Costea and Tardif 2003).